"Hear the TV Better - No Uncomfortable Headset"
The Audio Fox is a complete solution for those with loss of hearing or those who just prefer a different volume level to those around them. It's your own personal volume control for the TV that - unlike most TV listening systems - does not require you to use wireless headphones! Plus, this latest version includes a headphone jack as well for those times when you need room silence. The sound travels from the TV to the speakers using a wireless transmitter which easily plugs into your TV. Everything you need is provided including the wireless transmitter and the necessary cables. 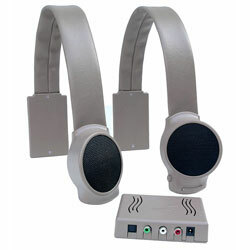 The cables and transmitter can be hidden because it uses an FM signal and line of sight between the transmitter and receiver is not required, unlike most wireless headphones for televisions, which require line of sight. - Easy to install. One simple connection and it works!